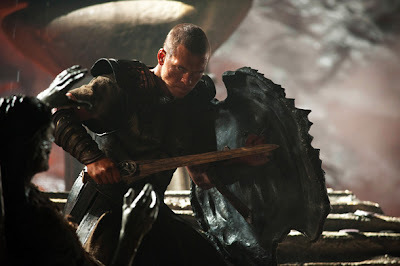 The first official photos of Sam Worthington as Perseus in Louis Leterrier's Clash of the Titans remake have been revealed. Being a huge fan of the 1981 original movie, I was super stoked to finally hear they were moving forward with this remake. Just from these photos it looks like this new version is a step up. It looks a lot darker and edgier than the original. I’m excited to see more photos/clips and trailers from this remake in the months to come. It looks as if the story line is slightly different from the original and I'm OK with that just as long as they involve all the main characters. The plot goes something like this... Born of a god but raised as a man, Perseus is helpless to save his family from Hades (Ralph Fiennes), a vengeful god of the underworld. 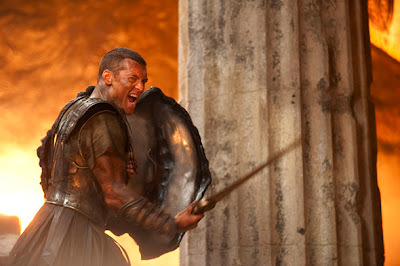 With nothing left to lose, Perseus volunteers to lead a mission to defeat Hades before he can seize power from Zeus (Liam Neeson) and unleash hell on earth. Leading a daring band of warriors, Perseus sets off on a journey deep into forbidden worlds. Battling unholy demons and fearsome beasts, he will only survive if he can accept his power as a god, defy his fate and create his own destiny. Louis Leterrier is directing from a script by Lawrence Kasdan (Raiders of the Lost Ark). Sweet! Lawrence Kasdan also wrote the screenplay to Empire Strikes Back. That was the best movie of the 6 in my opinion. It was darker, edgier, and just plain better. I’m excited to know he’s going to put his elements into this movie. That movie is going to be off the collar! I loved the 1st one when i was really young. I was always wondering when they were going to remake it. With todays technology it would be the shizzle! I hope they do it justice and not f*ck it all up like a few hollywood movies in the past. Stay tuned I guess. This will be so much fun to see! I like the darker and not so cheesy overtone- I'll definitely be seeing this! I might have peed my pants a little bit from overexcitement. Hades and Zues are cast PERFECTLY! I need a word more perfect than perfect for that casting, actually.